Oh, there's no question about it: directing. You are the architect. If it's good, great. If it fails, it's because your vision wasn't good. It's the idea of building something from the foundation up. When you're an actor, you're a slave to other people's visions. You're an accomplished writer. How has your writing for the screen affected your acting? Carey Wallace, CHELSEA, MICH.
Well, my writing for the screen is really the reason I'm here. I was not very good in school. If you're not brilliant, you try to find something that resonates. With acting, I was going nowhere. I was like Mugger No. 3 in every movie. When you're playing the fourth lead on Spy Kids, you know you're not doing well. I grew up watching your movies. Why do you think there's such strong sentiment these days against action films? Javier Negron Rivera, LAS PIEDRAS, P.R. There has always been an elitist attitude toward action films. Good action films  not crap, but good action films  are really morality plays. They deal in modern, mythic culture. The industry has dismissed that, which I think is a big flaw. Action films have been the cornerstone of this business. Without those escapist films, they wouldn't be making the so-called important dramas. I think audiences have hit the wall with CGI and special effects. They have seen so many over-the-top events that they can't suspend disbelief. I think because some of the films have not delivered, there might be a revisionist return to classic action films like The Wild Bunch or the Charles Bronson [films] or Dirty Harry. 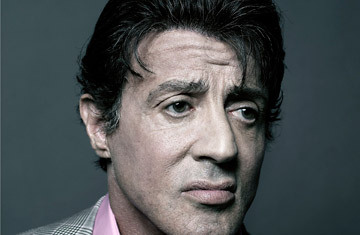 Is there a chance in hell you will ever write, direct and star in another Rocky movie? Kelly Doerfler, CRANBERRY TOWNSHIP, PA. The last Rocky took 19 years to get off the ground, and it was quite a challenge. It'd be interesting to do a Frank Capra  esque one, where Rocky runs for mayor: a simple blue-collar guy goes all the way. But I learned in Rocky V that you really can't tamper with that formula. When he's outside the ring, that's another character. You've seen the end of Rocky. I'm really happy with the way he rode off into the sunset. When I was younger, I thought it was a burden, and I did everything in the world to go against it. Now that I've gotten older, it's the greatest thing that's ever happened to me. I took my run at drama. I've done my things with comedy, and this is where I belong. I'm pretty good. I've always been very aggressive and quick with my hands. That's why I decided, when I had the chance to do Rocky, to become a boxer, because I thought I could pull that off, as opposed to a tennis player or a running back. Yeah, I do every now and then, believe it or not. It does work. Even after 30 years it gets me going. It's amazing. Are there any more goals you wish to accomplish? Travis Chandler, VERONA, VA. There are always goals. If you don't have a mountain, build one and then climb it. And after you climb it, build another one; otherwise you start to flatline in your life. People think retiring is fun. Well, maybe, but if you have a certain kind of fire inside, there is no end in sight. What made you not want to follow through with Rambo 5? Alfonso Pinto, WHITTIER, CALIF. It would be very inappropriate at my age to have Rambo disappearing into the woods. Where's he going to go? When does he stop running  when he's 90? He can't run anymore. Why? Because he can't get his walker up the hill!